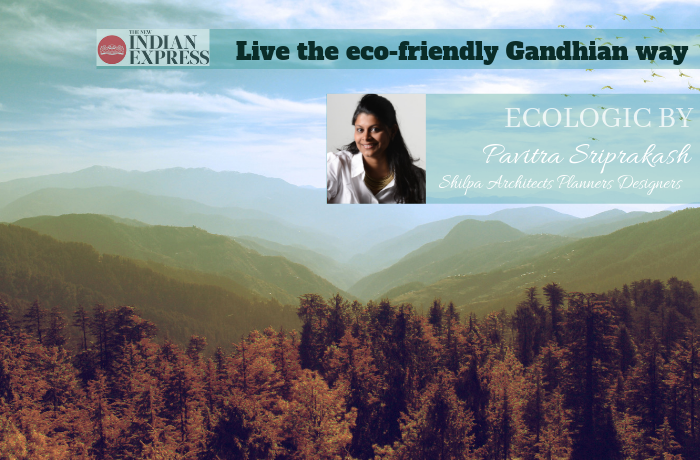 29-Jan-2019: Pavitra Sriprakash, Director and Chief Designer at Shilpa Architects Planners Designers writes a weekly column on Sustainability for The New Indian Express titled “ECOLOGIC”. This week she writes about the Gandhian’s principles applied to sustainablity. Republic day is celebrated every year with great pride on January 26 to honour the Constitution of India. As we have just celebrated our 70th Republic Day, it makes me proud to be Indian and also brings me back fond memories of Doordarshan. Waking up to watch the live telecast of the parade was a ritual for us growing up; and coming from a family with a military background meant this was taken more seriously in my home than others. Nonetheless, the parade and the floats formed an indelible impression on me and I continue to try to watch some portion of the parade every year. The 2019 Republic Day celebration was special as this year marks the 150th birth anniversary of ‘The Father of our Nation’ Mahatma Gandhi. Around 17 tableaux from states/Union Territories and six from various ministries were displayed in the parade based on the theme ‘Gandhi’. Over the past years, the floats from various States have showcased diversity in culture and some have even addressed the environment — but, this year with the theme ‘Gandhi’, I wanted to explore the connection between Gandhian principles and sustainable living. I have always been struck by Gandhiji’s approach as he was way ahead of his time. He understood that western civilisation was completely ‘unsustainable’. And this understanding of his came almost in the first decade of the twentieth century — while he launched his first movement of non-violence in South Africa. Gandhiji’s teachings were based on truth and non-violence. He always stressed on simplicity of life, unity of all religions and of mankind. In his book The Hind Swaraj, he stated that the relentless quest for more material goods threatened the future of humanity. Even though there was no direct reference to the earth or environment, it talked about the predatory nature of man and our ability to disregard nature. In a much broader sense, it posed a compassionate vision towards the planet and thereby prompted us to take measures in safeguarding it. In hindsight it is tragic that it has taken the world so long to realise that lifestyle of the developed countries and their path of development is truly unsustainable. Outside a net-zero housing society in London, it reads — “If everyone on the planet consumed as much as the average person in the UK, we would need three planets to support us.” Today, as we scramble to help keep the planet from the tipping point of no return against climate change, we can turn back to Gandhian principles which still seem relevant after so many decades. In some of his other writings he references the three kinds of nourishment that every man needs — air, water and food. He described specially ‘air’ as the most essential aspect — stating that “Nature has provided it to such extent that we can have it at no cost — but modern civilisation has put a price even on air.” These writings remind us of the importance of our actions in polluting the air, scarcity of water and food security — all major points as part of the UN’s goal on sustainable development for the world. So, let us go back to the founding principles of this country — Live simply and kindly, to ourselves and the planet.